During the reporting period of April 1 to September 30, 2012, the Coalition and our Afghan partners blunted the insurgent summer offensive, continued to transition the Afghan National Security Forces (ANSF) into security lead, pushed violence out of most populated areas, and coalition member nations signed several international agreements to support the long-term stability and security of Afghanistan. In May, President Obama and President Karzai signed a Strategic Partnership Agreement, reflecting the two governments’ desire for an enduring partnership. At the May 2012 Chicago Summit, North Atlantic Treaty Organization (NATO) - International Security Assistance Force (ISAF) nations also pledged to support Afghanistan through 2017. This was followed in July by the Tokyo Conference, at which the international community declared its support for Afghanistan by linking specific reforms in governance and rule-of-law by the Afghan government with sustained financial assistance through 2015. During the reporting period enemy-initiated attacks (EIAs) were up one percent compared to the same period last year, due in large part to a shortened poppy harvest employing low-level insurgents far less than in past years. However, EIAs are down 3 percent from January to September 2012 compared to the same period in 2011, after dropping nine percent in 2011 compared to 2010. EIAs are now disproportionately occurring outside of populated areas, and the security of many of Afghanistan’s largest cities increased substantially during the reporting period. Security progress and the development of the ANSF during the reporting period have enabled the security transition process to continue in accordance with the framework agreed to at the 2010 Lisbon Summit. As of the end of September 2012, roughly 76 percent of Afghans are living in areas where the ANSF has begun to assume the lead for security. Despite these and other positive trends during the reporting period, the campaign continued to face challenges, including a rise in insider attacks. The rise in insider attacks has the potential to adversely affect the Coalition’s political landscape, but mitigation policies and a collective ISAF-ANSF approach are helping to reduce risks to coalition personnel, and to sustain confidence in the campaign. The cause of and eventual solution to this joint ISAF and ANSF problem will require continuous assessment; it remains clear that the insider threat is both an enemy tactic and has a cultural component. The many mitigation policies recently put in place will require additional time to assess their effects, although the number of insider attacks has dropped off sharply from the peak in August. The insurgency’s safe havens in Pakistan, the limited institutional capacity of the Afghan government, and endemic corruption remain the greatest risks to long-term stability and sustainable security in Afghanistan. The Taliban-led insurgency and its al-Qaida affiliates still operate from sanctuaries in Pakistan, however, the insurgency and al-Qaida continue to face U.S. counterterrorism pressure within the safe havens. U.S. relations with Pakistan have begun to improve following the re-opening of Pakistani Ground Lines of Communication (GLOCs), and there has been nascent improvement with respect to cross-border cooperation between Pakistan and Afghanistan. Although the insurgency’s kinetic capabilities have declined from their peak in 2010, the insurgents remain resilient and determined, and will likely attempt to regain lost ground and influence through continued assassinations, intimidation, high-profile attacks, and the emplacement of improvised explosive devices (IEDs). Widespread corruption continues to limit the effectiveness and legitimacy of the Afghan government. Despite these challenges, the Coalition continued to make measured progress toward achieving its strategic goals during the reporting period. The United States completed the final stage of the phased recovery of the U.S. surge forces during the reporting period. As of September 20, 2012, the United States completed the drawdown of all 33,000 surge forces, consistent with the plan outlined by President Obama in June 2011. Despite this redeployment of forces, EIAs continued to decline through the first nine months of 2012, due in part to the increased capability of the ANSF. Between March 1st and September 30th, the United States decreased its military forces in Afghanistan by 25 percent, while other Coalition forces increased by one percent. Approximately 68,000 U.S. forces now remain in Afghanistan, and planning continues to determine future force level requirements. The U.S. remains committed to the long-term security and stability of Afghanistan. The end of the surge provides an opportunity to look back upon its accomplishments. Many security metrics have improved during the last two years. The comparison in violence between 2012 to date and 2010 (the first year with surge-level forces present for the same nine month period) is stark: EIAs have declined by 12 percent, IED explosions have declined by nine percent, ISAF-caused civilian casualties have declined by 28 percent (insurgent-caused civilian casualties increased by 11 percent), Direct Fire (DF) attacks have declined by nine percent, and indirect fire attacks are down by 24 percent. The ANSF has grown by 88,464 personnel, and has dramatically increased its capabilities. The areas of the country influenced by the insurgents and the ability of the insurgency to attack the population have been significantly diminished. Although challenges remain and progress in Afghanistan has been uneven in many areas, the security gains resulting from the surge are clear. The improvement in the security of the populated areas of Afghanistan was the most significant security-related development of the reporting period. Security dramatically improved in most of Afghanistan’s five most populous districts, with EIAs in the first nine months of 2012 compared to the same period in 2011 dropping 22 percent in Kabul, 62 percent in Kandahar, 13 percent in Herat, 88 percent in Mezar-e-Sharif, and rising 2 percent in Kunduz.2 In many of the most contested areas of the country, insurgent attacks are becoming more isolated, and are occurring further away from population centers. The majority of Afghanistan’s 405 districts now experience very low levels of EIAs; 80 percent of attacks occur in districts encompassing only 20 percent of the population, and nearly one half of all attacks country-wide occur in just 17 districts – that contain only five percent of the population. The Taliban’s ability to attack the people of Afghanistan has been diminished, particularly in Kandahar, the operational and ideological base of the Taliban. The slight rise in EIAs this reporting period when compared to the same period in 2011 was caused by a number of factors. In past years, many low-level insurgent fighters took part in the poppy harvest, substantially lowering attack levels for roughly six weeks. The harvest period this year was approximately 2-3 weeks due to weather conditions, as opposed to the 6-8 weeks observed in past years, effectively freeing up these low-level fighters to begin the fighting season early. This contributed to unusually high EIAs in April, May, and June. Conversely, the remainder of the reporting period had lower levels of EIAs when compared to last year. Major ISAF and ANSF operations also increased 21 percent compared to last year, and many of the EIAs that occurred during the reporting period were a result of this increased operational tempo. The security situation in Regional Command South (RC-S) improved slightly during the reporting period, with EIAs down four percent compared to last year, most notably in populated areas in and around Kandahar City. ISAF transferred security responsibility to ANSF lead in Kandahar City in May 2012, after which the security situation improved significantly compared to last year, due largely to Coalition-initiated operations. Attacks were instead concentrated in less densely populated but highly contested areas in the “Taliban heartland,” Maiwand, Zharay, and Panjwa’i; these districts accounted for more than 12 percent of nationwide EIAs, but have less than one percent of the nationwide population. The security situation for populated areas in Regional Command Southwest (RC-SW) also improved during the reporting period, despite a two percent increase in overall EIAs compared to the same period last year. The populated areas in RC-SW saw a decrease in EIAs, with much of the fighting now occurring in remote areas. Nahr-e Saraj is the most violent RC-SW district, with 10 percent of total EIAs for all of Afghanistan, and yet has less than 0.5 percent of the Afghan population. Progress in security in Regional Command - North (RC-N) and Regional Command – West (RCW) was mixed. EIAs were up by 28 percent in RC-N and 44 percent in RC-W compared to the same period last year. However, these areas are still much less violent than southern and eastern Afghanistan. EIAs in RC-W and RC-N combined make up just eight percent of total EIAs in Afghanistan. Additionally, the rise in RC-W EIAs was likely the result of spillover from RCSW, as ANSF and ISAF operations have pushed insurgents from populated areas in the Helmand River Valley north into Farah and Ghor Provinces. Despite the progress of ANSF-led security efforts, insurgents also assassinated several political leaders, garnering international media attention. In RC-N and RC-W, attacks are increasingly criminal in nature; as the insurgency recedes, narcotics trafficking and criminal patronage networks are becoming more prominent. Pakistani-based sanctuary for insurgents, such as the Haqqani Taliban Network in North Waziristan, as well as the financial and operational support that insurgents receive from various sources, keeps the security situation along the border with Pakistan in Regional Command - East (RC-E) volatile. Although EIAs decreased by 1 percent in RC-E compared to last year during the reporting period, eastern Afghanistan accounted for almost a third of all insurgent attacks throughout the country. The death in August of Baddrudin Haqqani, the senior operational commander for the Haqqani Taliban Network, may have temporarily disrupted Haqqani operations, but the full impact of this event remains unclear. In Regional Command - Capital (RC-C), sustained National Directorate of Security (NDS) and ANSF-led operations resulted in greatly improved security throughout Kabul, which was already far more secure than most of the country. Progress was highlighted by successful Afghan security responses to the April 15 and June 22 complex-coordinated attacks in which coordinated ANSF responses effectively contained the attacks with only minor ISAF support. EIAs decreased by 25 percent compared to last year, and high-profile attacks (HPAs) dropped from 12 during the same period in 2011 to just six this year. The insurgency was unable to re-take significant territory during the reporting period, despite stating this as one of its chief goals during the fighting season. Instead, the insurgency continued to lose territory overall, including much of its main safe havens in Southern Afghanistan. The insurgency is resilient, and its sanctuaries in Pakistan prevent their decisive defeat in the nearterm. But the growth of the ANSF combined with high ISAF force levels enabled the Coalition to secure much of the country. The insurgents’ ability to threaten major population centers has been significantly weakened. Insurgent attacks, particularly in RC-S and RC-SW, have shifted from primarily offensive operations in Afghan population centers, to primarily reactive operations in areas that had previously been safe havens. Taliban territorial influence and control decreased last year; this trend continued during this reporting period. The insurgency has nevertheless retained its capability to carry out attacks at almost the same level as last year during the reporting period. After a substantial decline in 2011 and early 2012, a number of violence indicators, including IED incidents and EIAs, have remained constant. Despite this leveling off of the number of attacks, the insurgency’s ability to carry out these attacks in populated areas has been greatly diminished. The insurgency has also retained the capability to carry out coordinated attacks infrequently, as evidenced by the attack on Camp Bastion on September 14 (in which six aircraft were destroyed, and another two were severely damaged). The Taliban-led insurgency remains adaptive and determined, and retains the capability to emplace substantial numbers of IEDs and to conduct isolated high-profile attacks. The insurgency also retains a significant regenerative capacity. As insurgent capacity to directly contest the ANSF and ISAF erodes, insurgents have increasingly resorted to asymmetric tactics in an attempt to regain territory and influence, including assassinations, kidnappings, intimidation tactics, encouraging insider attacks, and strategic messaging campaigns. The insurgency continues to receive critical support – including sanctuary, training infrastructure, and operational and financial support – from within neighboring Pakistan. The availability of sanctuary inside of Pakistan enables key elements of the insurgency to remain potent and threatening, including the Afghan Taliban and the Haqqani Taliban Network. ISAF’s main effort is to facilitate the conditions under which the ANSF successfully assumes full security responsibility for Afghanistan by the end of 2014. ANSF force growth and training efforts yielded significant operational improvements during the reporting period. The ANSF is increasingly taking over responsibility for securing Afghanistan, and is conducting the vast majority of operations. Although many of these operations are routine patrols, the ANSF are now (as of September) unilaterally conducting approximately 80 percent of total reported operations and are leading roughly 85 percent of total operations.3 Additionally, the ANSF have started to expand security independently in areas where ISAF does not already have an established presence, demonstrating initiative and increased capability. ISAF carries out only 10 percent of total reported operations unilaterally and is in the lead for only 15 percent of operations. ISAF casualties in 2010 were roughly 60 percent of total friendly casualties, with the ANSF taking roughly 40 percent. This ratio was reversed in 2012, and overall friendly casualties have declined. This reversal is indicative of the ANSF increasingly taking the lead in the field. The ANSF have also increased their ability to plan, carry out, and sustain large-scale operations, as evidenced by Operation Kalak Hode V in RC-S. This 11,000-person operation was principally planned, led, and manned by the ANSF. The operation, focused on disrupting the insurgency, involved coordination among the Afghan Army, Police, Border Police, and National Directorate of Security. The operation was logistically supported through Afghan supply channels. While small in number, insider attacks have the potential to significantly disrupt the Coalition mission in Afghanistan. However, the relationship between the ANSF and the Coalition remains strong, particularly out in the field, where soldiers face a common enemy every day. The motivations behind the majority of the attacks in 2012 are varied and include but are not limited to: infiltration, impersonation, co-option, post-traumatic stress, inter-personal disputes and extremist views. Regardless, insider attacks are helpful to the insurgency, whether the insurgency is directly responsible or not. As such, ISAF and the Afghan government are approaching this as both an enemy tactic and an issue that has a cultural component. Coalition forces and the ANSF are working together on a comprehensive, combined response and have implemented several measures, including requiring higher-level approval for some partnered operations. ANSF investigations into insurgent ties to ANSF members have already resulted in more than 400 arrests. However, the overall efficacy of our counter-measures cannot yet be assessed, as most measures have only recently been implemented. There were several improvements with regard to Pakistan this reporting period, including the reopening of the GLOCs and improved border coordination. Although strained, U.S. relations with Pakistan are beginning to improve. Pakistan agreed to reopen the U.S. and ISAF GLOCs into Afghanistan on July 4, and signed a memorandum of understanding governing the transit of U.S. cargo through Afghanistan later in the month. No new fees were applied to U.S. cargo that had been held in Pakistan since last year, which began to transit to Afghanistan soon after the agreement was reached. The reopening of the GLOCs allowed ANSF equipment, and in particular vehicles which had been held in Pakistan since the GLOC closure, to enter Afghanistan, helping the ANSF to meet its fielded force requirements. At the time of publication, U.S. and Pakistani negotiators were finalizing arrangements that, once completed, will allow new U.S. cargo to transit Pakistan to Afghanistan, and will open Pakistani GLOCs to U.S. retrograde cargo leaving Afghanistan. However, sustainable cross-border cooperation and coordination remains a significant challenge, which causes mistrust between Pakistan and Afghanistan. The Pakistani military, the ANSF, and Coalition forces all fire across the border in response to militant activity on both sides, increasing the risk of a serious incident. Although cross-border attacks remain a highly contentious issue, relations between Afghanistan and Pakistan have shown some signs of improvement. Recent meetings between senior Pakistani and Afghan officials have resulted in slightly improved cooperation between the two countries, specifically on efforts toward improved stability in Afghanistan. Additionally, within the last six months, there has been improvement in operational coordination between Afghanistan and Pakistan on border, including complementary ANSF, ISAF, and Pakistani military operations. Overall, relations between Pakistan and the U.S., and Pakistan and Afghanistan are improving, but tensions remain. The insurgency continues to benefit from sanctuaries in Pakistan. Pakistan’s passive acceptance of insurgent sanctuaries, selectivity in counterinsurgency operations that target only Pakistan-focused militants, and ineffective actions to interdict material support such as IED components to the insurgency, continues to undermine security in Afghanistan and threaten the ISAF campaign. 1 This report is submitted in accordance with Section 1230 of the National Defense Authorization Act for Fiscal Year 2008 (Public Law 110-181), as amended, and Section 1221 of the National Defense Authorization Act for Fiscal Year 2012. The report is submitted consistent with requests in House Report 112-10 and Senate Report 111-295. It includes a description of the comprehensive strategy of the United States for security and stability in Afghanistan. This report is the tenth in a series of reports required every 180 days through fiscal year 2014 and has been prepared in coordination with the Secretary of State, the Director of the Office of Management and Budget, the Director of National Intelligence, the Attorney General, the Administrator of the Drug Enforcement Administration, the Administrator of the United States Agency for International Development, the Secretary of the Treasury, and the Secretary of Agriculture. This assessment complements other reports and information about Afghanistan provided to Congress; however, it is not intended as a single source of all information about the combined efforts or the future strategy of the United States, its coalition partners, or Afghanistan. The information contained in this report is valid as of September 30, 2012. 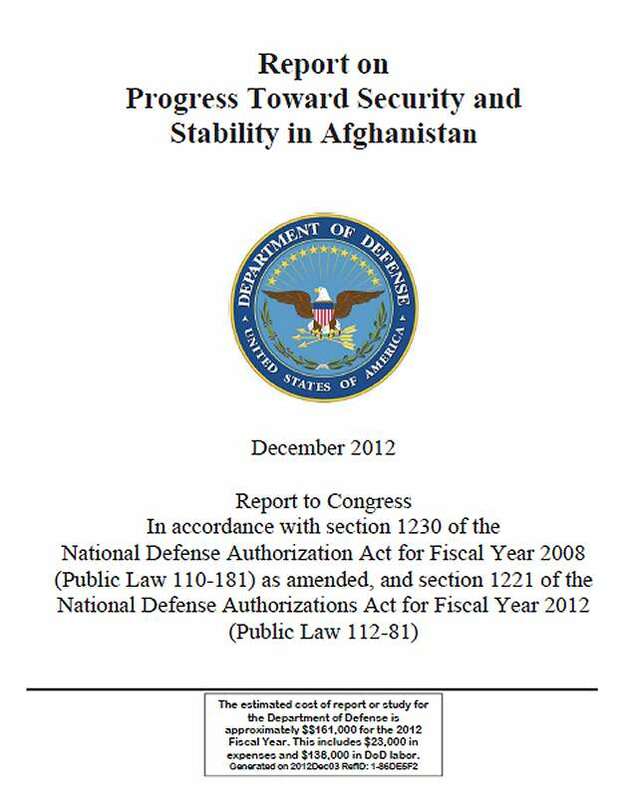 NOTE: This is a historical document that covers progress in Afghanistan from April 1, 2012, to September 30, 2012. The next report will include an analysis of progress toward security and stability from October 1, 2012, to March 31, 2013. 2 EIA figures are from January 1 through September 27, 2011 compared to 2012. 3 The data on operations in this paragraph represents only reported operations in RC-E, as this was the only RC that fully reported low-level operations as of the end of the reporting period. This data is indicative of operations in the rest of the country, however, the actual figures may vary in other RCs. This data on operations only covers the period from June through September 2012, as ISAF did not report low-level and routine operations before June.